Ready to serve. Consume soon after opening. Can be eaten together with rice or noodles, and cook as seasoning. 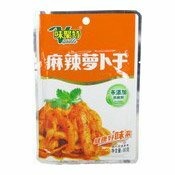 Ingredients: Turnip (84.18%), Rapeseed Oil, Salt, Chilli (2.5%), Sugar, Wine, Flavour Enhancers (E621, E627, E631), Preservative (E270), Sichuan Peppercorn (0.1%) Spices (0.01%). 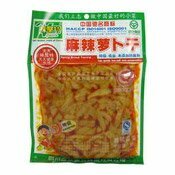 Simply enter your details below and we will send you an e-mail when “Spicy Dried Turnip (Mala) (味聚特辣蘿蔔乾)” is back in stock!